As the fall semester winds down and the holidays draw near, I thought it fitting to offer a couple of book recommendations for the upcoming season of leisure and festivity; books about, well, leisure and festivity! 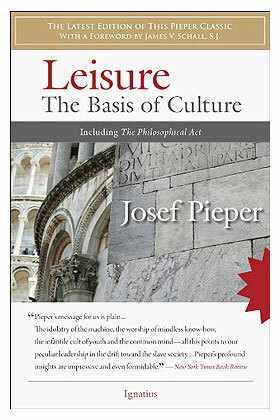 In Leisure the Basis of Culture, Josef Pieper argues that Western society has virtually abandoned, to its great detriment, the practice of genuine leisure, defined as time spent in contemplation of higher things. There has been a great shift, he says, in the conception of mankind and the meaning of man’s existence towards a bankrupt philosophy of total work. In this view, man “is essentially a functionary, an official, even in the highest reaches of his activity.” But this worker-of-the-state life cannot contain the whole of human existence, one which includes activities that are valuable for their own sake. For example, reading and discussing great works of literature, philosophy, theology, and poetry; the quiet consideration of a beautiful painting or live landscape. These are the things that highlight the meaning, truth, and beauty in what Pieper calls “the whole of creation.” They are activities that are worthwhile even if they aren’t “for” some pragmatic end. True leisure prevents us from being “half-hearted men with flat souls,” as Fr. James Schall would say. Pieper’s assertion about the necessity of true leisure resonates with our intuitions, conscious or not, about the nature of things, including ourselves. The lynch pin of his thesis, nota bene, is the metaphysical assumption it is based upon. After all, a creator God must exist for the idea of “the whole of creation” to be coherent, for there to be any transcendent, immaterial truths to serve as objects of contemplation. “Philosophy…is not the loving search for any kind of wisdom; it is concerned with wisdom as it is possessed by God,” he argues. Furthermore, man must be more than a material entity for true leisure to occur and have significance. The increasing secularization and materialism of Western culture is at the root of the current dysfunctional relationship between work and leisure and the misconceptions about the essence of the latter; yet, Pieper spends little time discussing this. In some ways, he addresses it implicitly, but the reader is left wishing Pieper had pressed this point much further, and had more powerfully contrasted the meaning found in theism with the alternative: the nihilism of godlessness. Our deepest convictions about ourselves and our desire to celebrate meaningful things causes a mental revolt against such hopeless nihilism, and the only absolute, final solution is God. Because of what we are by virtue of the divine grounding of the world, there is objective meaning and value in humanity; birth, life, love, and death are not absurdities, but sacred elements of an inherently precious human existence.